grisell wrote: To me, it looks like wild mould. Salami mould as I know it, doesn't grow in a patch-like way but evenly over the product and never produces coloured spots. Would this not be more because you spray your sausage though? that would mean that you get an even covering to start off with, rather than growth from a few points? Im going to keep curing it i think, I have nothing to lose for a first experiment other than time, as I will use common sense when coming to eat or not, ie. does it smell/look afwul. Not least, this one was done with a friend, who is a welshman. He can eat it first..
That's possible. However, based on the number of possible mould species and the fact that many of them are dangerous, I personally would be careful. As with wild mushrooms, taste and smell is no indicator for danger. I can't order you what to do, but you wrote that you had experience with growing mushrooms (I assume champignons?). Would you let wild mushrooms grow in your plantation or eat any mushrooms that didn't look like champignons? As I said, it's totally up to you. I know this wont put right what has already happened with the mold at the moment.. but it will stop whats happening now from getting any worse! 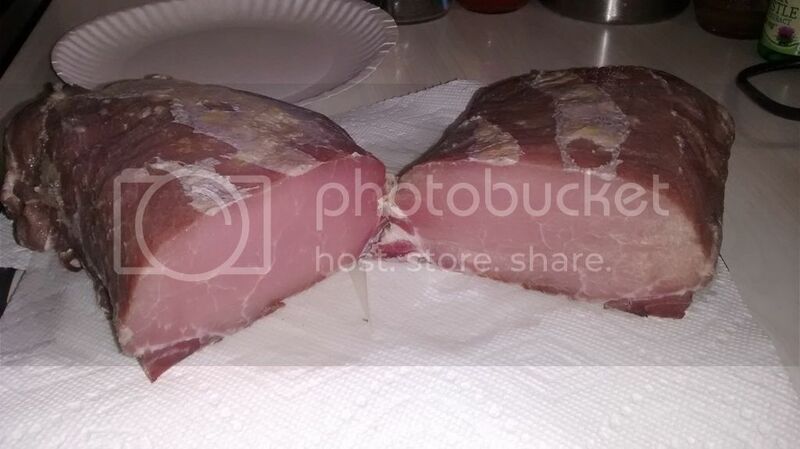 Pictures are capicola no cultures applied. Is this green mold good or bad, should I wash off. Still has around 3 weeks left and one week ago did not have any mold. The other picture is Lonzino, has a few specks of white mold and has about 1 week left. panicked, needed to act fast being it just appeared over the last week. So I washed in vig & h20 and finialized wine and re-coated paprika and washed the lonzion too. Going to be busy for a few days, figured I do it now. Smelled very good, still have hopes for it. I'm very sorry: This doesn't look good at all. You may wash away the mould for the present, but it will return. 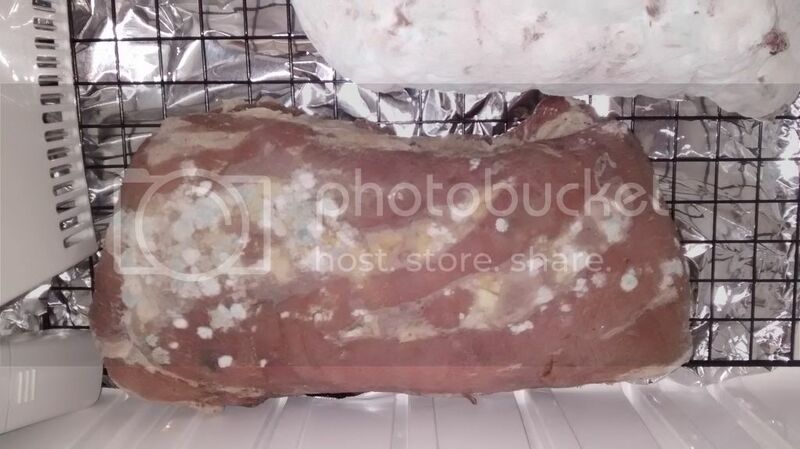 The mould has already infected the meat. I wouldn't eat it. 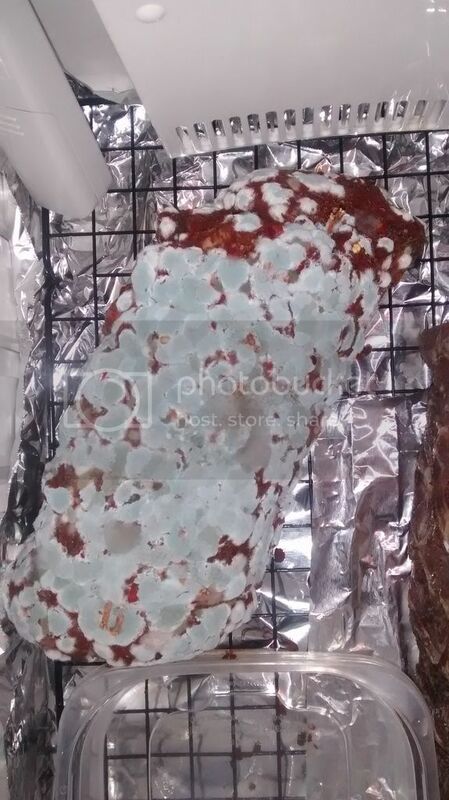 Do you think the paprika and pepper flakes has anything to do with the mold? The mold was not on it last weekend and now appeared quite a bit. This is not the same green mold that is seen in some pictures you think? The mold doesn't appear to be slimy or black so it is probably not harmful, but whether the taste has been affected is another thing. I would finish the drying then make a decision. When I washed it off, it seemed dry and I had to rub it well to remove it. But that's a relative question, most washed right off, some spots I rub on quite a bit to remove the green or green stain. I will take some more pictures after about a week and removing some of the moister. 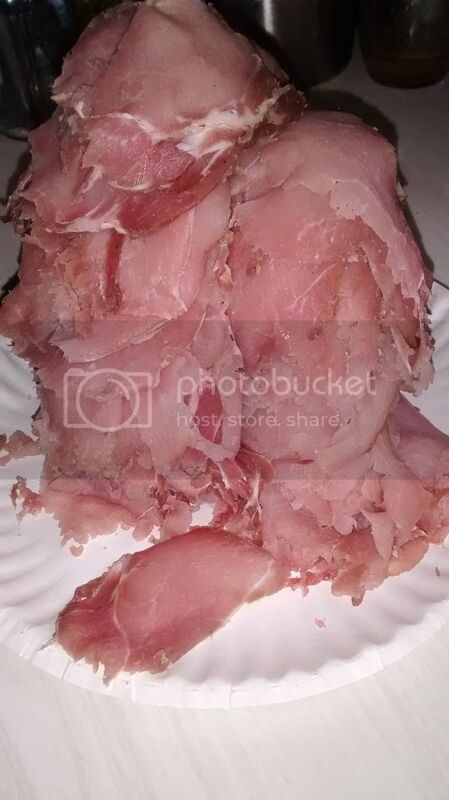 This is my first attempt at coppa and I did not use a good bacteria dip or spray, just natural. The coppa was fine until sometime this past week. As far as the smell, it smells wonderful.. The lonzino is done the 20th, more time to dry out more if I want. 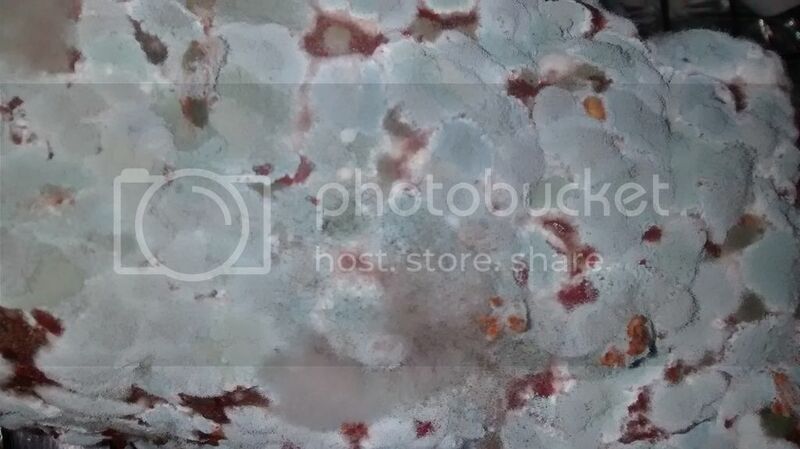 It had a few green spots of mold on the underside, which you cannot see in the picture. Being spoked I might pull it out the 20th. I am letting it ferment and see how it goes. 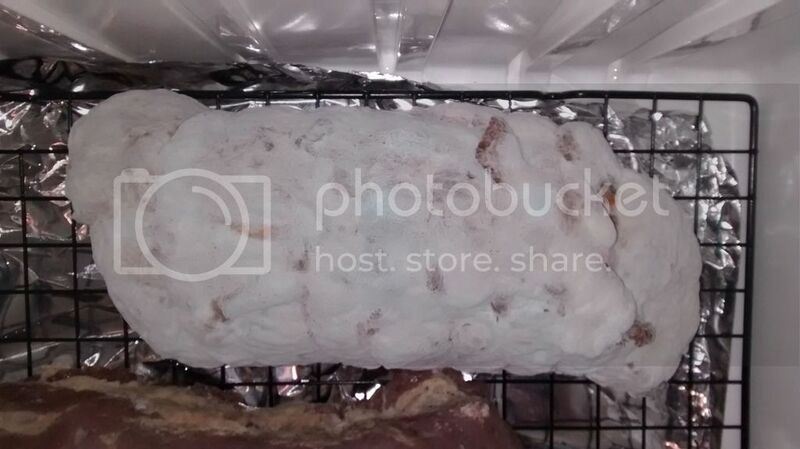 NCPaul wrote: The mold doesn't appear to be slimy or black so it is probably not harmful, but whether the taste has been affected is another thing. I would finish the drying then make a decision. Well, it is not surprising that it went wrong. You probably made everything else right but you didn't inoculate with a benign mould culture? Then, obviously, the ever-present wild mould took over. This is almost impossible to avoid, and that is why I always recommend people to use a mould culture. These can be bought from the internet or grown from a commercial salami. Most probably, you will not be able to wash the mould away with vinegar or anything. The mould has grown deep into the product long before it is visible. Washing the surface doesn't help. Not even smoking will kill it. Here's a picture 1 week after the last one of the coppa. It is mostly white now, looks think. It still has about MIN 2.5 weeks left to go. What do you think? picture size is to big, should have made it smaller. 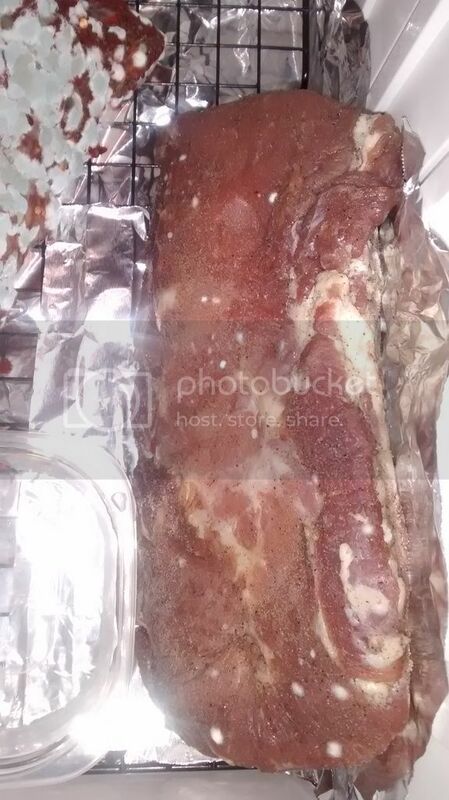 NCPaul wrote: The mold does appear to be slimy or black so it is probably not harmful, but whether the taste has been affected is another thing. I would finish the drying then make a decision. Last edited by ttx450 on Sun May 20, 2018 5:36 pm, edited 1 time in total. Here's the lonzino, it should be done. I was orgianlly going to try and dry it longer, but I think I am going to pull it out and cut it and see what it smells like. I followed Len's pol recipe to make Lonzino, it's ok. Not like Prosciutto. could use some improving.